Vacation, this Norman Rockwell painting, appeared on the cover of The Literary Digest published July 3, 1920. The alternate title for this work is Boy Carrying Girls' Books. 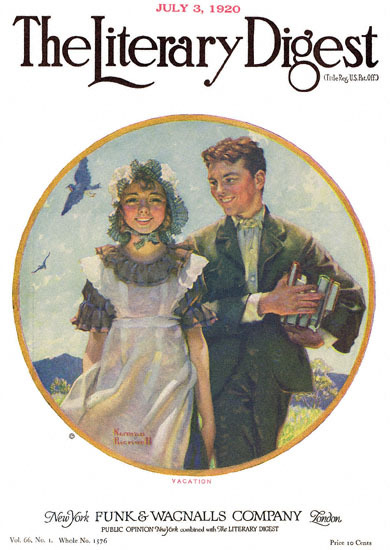 This illustration was Rockwell's sixteenth picture featured on the cover of The Literary Digest. The original oil on canvas painting, 20 x 20 inches or 51 x 51 cm, was last reported to be part of the collection of the Royal Palm Gallery,Ltd. One of Norman Rockwell's recurring topical themes was boys and girls and their relationships to that dreaded and loved institution, school. He painted school as more dreaded than loved in his early years. So it follows that summer vacation was a much loved time of the year. Vacation was only one of 47 Norman Rockwell Literary Digest covers; here is the list of more Norman Rockwell Literary Digest scans. In this classic illustration, Rockwell again visits the theme that, joy of joys, summer vacation has arrived. We all remember that feeling. Note the broad smiles on both childrens' faces. Note the birds flying happily overhead. Note the blue sky in the background. This is a happy time and a happy painting. We assume that the two children are a couple of sweethearts. He is carrying her books home for her. He also has a sweetheart look on his face as he gazes toward her. We do not know why The Literary Digest published this painting in July instead of June. The Digest was fairly far down on Rockwell's list of desired publications. He may have been late submitting to the magazine. Most likely, he started with The Saturday Evening Post and worked his way down his list.